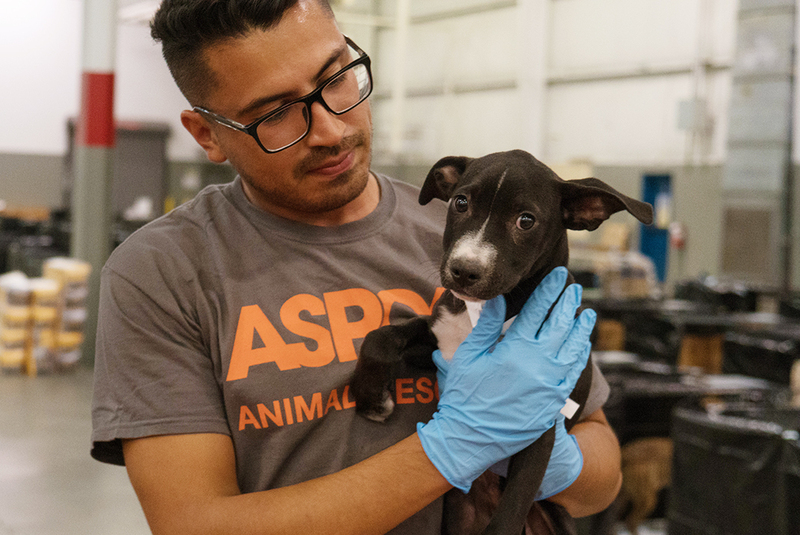 As part of our ongoing efforts to help animals impacted by Hurricane Irma, the ASPCA has delivered critical pet supplies to dozens of shelters and resource centers in communities affected by the storm throughout Florida. So far, approximately 11,500 cats and dogs have been assisted through the distribution of pet food, bedding, medical supplies, crates and other resources for shelters and pet owners in need. In addition to distributing supplies, we provided sheltering assistance for homeless animals at Lee County Domestic Animal Services, Miami-Dade Animal Services (MDAS) and the Florida Keys SPCA, and we relocated more than 1,200 unowned shelter animals out of impacted communities. American Red Cross – Key West; Barky Pines Animal Rescue and Sanctuary; Bridge to Hope; Broward County Animal Care and Adoption; Cat Depot; Central Broward Regional Park; Centro Campesino; Citrus County Animal Services; First Coast No More Homeless Pets; Flagler Humane Society; Florida Keys SPCA; Griffing Community Center; K9Resque; Lake City Humane Society; Lee County Domestic Animal Services; Miami-Dade Animal Services; Nate’s Honor; Notre Dame D’Haiti Catholic Church; Okeechobee County Animal Control & Animal Shelter; Peggy Adams Animal Rescue; Safe Pet Rescue; SPCA of Brevard; Tampa Humane Society; Tri-County Animal Rescue; and Trust Again Pet Shelter, Inc.
We’ve also cared for hundreds of homeless cats and dogs at our emergency shelter in Duncan, South Carolina. We are now winding down operations at this temporary shelter, as we place homeless animals with partner groups throughout the country, including in South Carolina, where these animals will be made available for adoption. We had set up our emergency shelter in Duncan as a safe place for homeless animals in need of immediate evacuation, enabling local shelters to make room for lost pets and owned animals who require temporary sheltering. Efforts like these are not possible without the support of our generous members. Thank you to all who have contributed to our emergency response and our work to ensure the health and safety of animals. For the past week, our disaster response team has remained on the ground in Florida and South Carolina, assisting local authorities with relocation, field rescue and emergency sheltering for more than 1,200 animals impacted by Hurricane Irma. 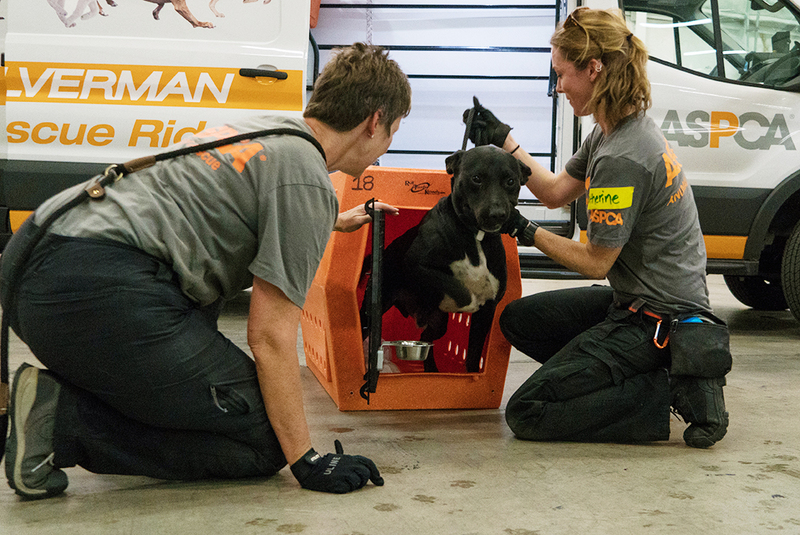 In Florida, the ASPCA has helped in transporting hundreds of shelter animals displaced by the storm, and mobilized our water rescue team in Lee County to help save the lives of animals at risk from the flooding. At the request of Miami-Dade Animal Services (MDAS), we’re providing sheltering assistance, resources to conduct field rescues and have been transporting shelter animals to our emergency animal shelter in Duncan, South Carolina, as well as other rescue groups based in California and Washington. At our 40,000 square-foot emergency shelter in South Carolina, we’ve accepted and cared for more than 500 shelter animals, as the origin shelters and rescue groups impacted by the disaster continue to make space for the influx of lost and owned pets in Irma’s aftermath. As many animal shelters across Florida are assessing their needs after the storm, the ASPCA is also in the process of establishing distribution centers to provide critical pet supplies to the affected areas. Our member support helps make life-saving work like this possible. View exclusive footage of our disaster response efforts in Florida. Animal Humane Society; Animal Rescue League of Boston; Animal Rescue League of Iowa; Anti-Cruelty Society; Charleston Animal Society; Dubuque Regional Humane Society; Grand Strand Humane Society; GreaterGood; Humane Society for Southwest Washington; Humane Society of Tennessee; Humane Society of the Tennessee Valley; Idaho Humane Society; Lincoln Memorial University; Louisa Community Animal Rescue Team; Louisiana SPCA; Marin Humane Society; New Hampshire SPCA; NYC Animal Care Centers; Petco; Petsmart Charities; Second Chance Animal Shelter; Toledo Area Humane Society; University of Tennessee Companion Animal Initiative of Tennessee; Wings of Rescue; Wisconsin Humane Society; and Young Williams Animal Village. Greatergood.org has generously donated crates, vaccines, dental chews, and other preventative medication for the displaced animals in our care in South Carolina, and funds to our disaster response efforts for Hurricane Harvey. Check out the latest video of the ASPCA’s efforts to transport animals out of Irma’s path and prepare for the storm’s aftermath. A transport of shelter animals arrived today at the ASPCA mega emergency shelter in South Carolina. View photos of the animals during their arrival and while settling in. 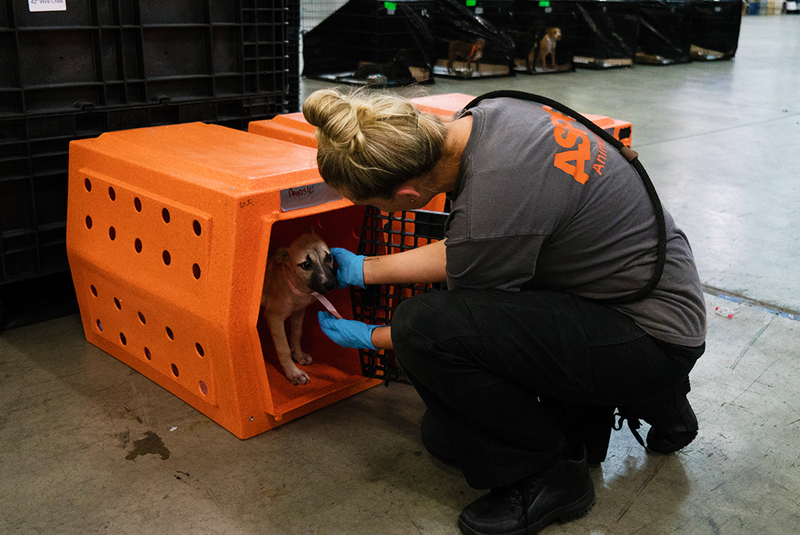 The ASPCA is on the ground in Florida and South Carolina assisting with pre-evacuation, relocation and emergency sheltering efforts for animals in the path of Hurricane Irma. Our responders are working to relocate approximately 600 shelter animals to an ASPCA emergency animal shelter we’ve established in Duncan, South Carolina. We expect to relocate hundreds more shelter animals from Florida, South Carolina and Georgia in the next few days, to safer grounds where they can ride out the storm. “As we continue our efforts in Texas to help pets and their owners displaced by Hurricane Harvey, we are expanding our efforts to provide much-needed resources and support to shelters and agencies along the coast as they prepare for the impending life-threatening storm,” says Tim Rickey, Vice President of ASPCA Field Investigations and Response. Please give today to help our life-saving work. 100% of your donation will go toward the ASPCA Field Investigations and Response Fund, to support all of our efforts for animals in disaster and cruelty situations. As the ASPCA continues our disaster response efforts in Texas—conducting search-and-rescue, managing an emergency animal shelter and reuniting families with their pets—we turn toward Florida, and the potentially catastrophic Hurricane Irma that approaches the Southeast. We have activated our disaster response team in anticipation of potential evacuation, rescue and sheltering needs before, during and after the hurricane. Now, we urge pet owners in Hurricane Irma’s path to follow our expert tips to keeping your pet safe during a disaster. If you evacuate, take your pets with you! Never leave them tethered to trees or poles, which prevents them from escaping high waters and getting to safe areas. Make sure all pets are wearing ID tags with up-to-date contact information. The ASPCA also recommends micro-chipping your pet as a more permanent form of identification. Create a pet emergency kit including medical records, water, bowls, pet food and pet medication. Choose a designated caregiver, like a friend or relative outside the evacuation zone, who can care for your pet in the event you are unable. Download the free ASPCA mobile app, which allows pet owners to store crucial pet records needed for boarding pets at evacuation shelters. It also includes a disaster preparedness checklist. "It's critical for pet owners to consider their animals when preparing for any disaster, and we strongly urge them to always bring their animals with them if they have to evacuate their home," said Tim Rickey, Vice President of ASPCA Field Investigations and Response. "The ASPCA stands ready to assist animals in Hurricane Irma’s path, but the first and best line of defense for a pet will always be a well-prepared owner." As we keep an eye on Irma, with reports of it being one of the most powerful Atlantic hurricanes ever recorded, we anticipate the requests for our assistance to help displaced animals. Please consider giving a generous gift today, and 100% of your donation will go directly to our Field Investigations and Response Fund, allowing our team to always be ready to response to future disaster and cases of cruelty.